When Kanye West revealed that he was in debt to the tune of $53 million, people probably wondered why he didn’t just ask his extremely rich wife for a small business loan. Although the “debt” was a bit of an exaggeration, one fan decided to help a brother out. Jeremy Piatt of Minnesota has set up a GoFundMe page for West and is looking to raise the 53 mil. 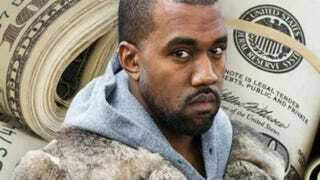 “Kanye West, prolific entertainer/fashion icon/celebrity/member of the Kardashian family needs our help!” Piatt writes. And, yes, people have donated. As of this writing, the page had raised $294 through the generosity of people named Taylor Swift and Mark Zuckerberg—not the real ones, of course, just people who don’t have anything else to do but play around on the Internet and waste money. It’s interesting to see that GoFundMe hasn’t closed the page, since it’s been notorious for shutting down spoof fundraisers.